Always attention to detail, technical skills, passion in our work and great attention to customer needs are the strengths that have allowed us to excel in the field of sale of AERO COLOR Schmincke 28 ml airbrush color 28022 CANDY SUNFLOWER YELLOW. Consultando il catalogo di Aerografando you will immediately notice how vast it is and how diversified the model range is Schmincke Aero Color CANDY, you will find the best AERO COLOR Schmincke 28 ml airbrush color 28022 CANDY SUNFLOWER YELLOW offers at the best prices on all AERO COLOR Schmincke 28 ml airbrush color 28022 CANDY SUNFLOWER YELLOW of the brands Schmincke. Transparent color, glossy finish, light resistant. A general concept for professional airbrushing techniques. The new airbrush design by Schmincke is a harmonic color assortment of 36 bright color tones, 12 colors and special effects. The colors of the Schmincke AERO COLOR are bright and bright, and can also be used very well with ink pens, nibs and brushes. AERO COLOR stands out for its optimal use characteristics: the colors for airbrush are very beautiful, they are resistant and can be used on almost all the surfaces. All colors are ready for use and thanks to the fineness, they can also be used without diluting them. If necessary, it can also be diluted with water. All colors are available in resistant glass vials with dropper. Many of the 36 harmonic colors and the 12 new effect colors are a pigment, which guarantees a brilliant blending result and an unlimited variety of color tones. A variety of colored shades are transparent or semi-transparent. A covering effect can be achieved by a single addition of the intense covering color AERO COLOR Supra white, opaque without lightening or without losing its color strength. AEROCOLOR colors adhere perfectly to all types of cardboard and paper, as well as to non-absorbent substrates, such as films, plastics, canvas and metal, after a suitable preventive treatment. The colors are simple to mask and can be used for graphic and aerial creations even for special airbrushing techniques. AEROCOLOR dries in a satin finish, is water resistant and is reproducible. All shades are, come result of the work of many years of research and development, a unique feature in the airbrush market: AERO COLOR in a very low time 'use. Product proposed Shake & Spray for the unique ability to be agitated and thanks to the unique and innovative recipe. 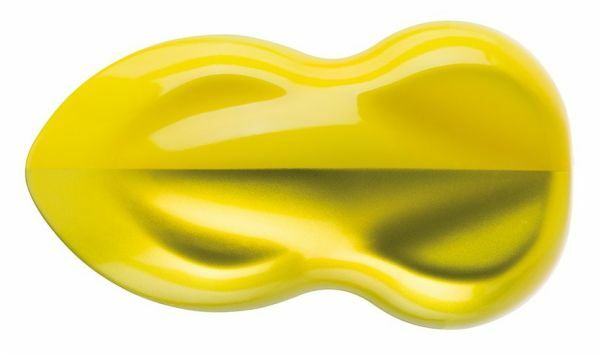 Read the reviews of our customers on AERO COLOR Schmincke 28 ml airbrush color 28022 CANDY SUNFLOWER YELLOW of the category Schmincke Aero Color CANDY. With us you will find only satisfied customers, thanks to a technical assistance made by those who really know the world Schmincke Aero Color CANDY. Review AERO COLOR Schmincke 28 ml airbrush color 28022 CANDY SUNFLOWER YELLOW of the brand Schmincke. Trust in the quality and professionalism of Aerografando on the sale of AERO COLOR Schmincke 28 ml airbrush color 28022 CANDY SUNFLOWER YELLOW, only from us you will find the best prices. You want to have more details on AERO COLOR Schmincke 28 ml airbrush color 28022 CANDY SUNFLOWER YELLOW 28022 or more generally on ours Schmincke Aero Color CANDY? You are looking for a Schmincke Aero Color CANDY but do not you find it in the catalog? Staff of Aerografando will answer all your requests.